My work is mostly inspired by nature, landscape, seascape and the elements. From this subject matter I can develop those areas I respond to most: such as space, rhythm, line, form, changeability and fluidity. 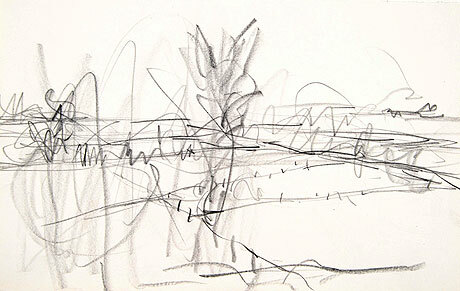 The drawing creates an immediate response to the landscape. When the drawing goes well I know immediately way to punctuate or what to leave out. From here I can choose to use colour, usually minimal palette. 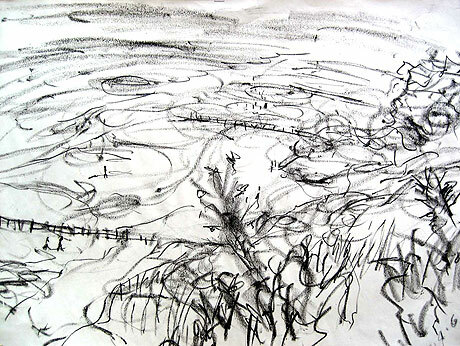 The colour is an emotional support for the line and form, which for me is the essential structure of my drawing. I like to depict the essential dynamic in a gestural style with out embellishment or decoration; an honest statement of what I perceive at that time. 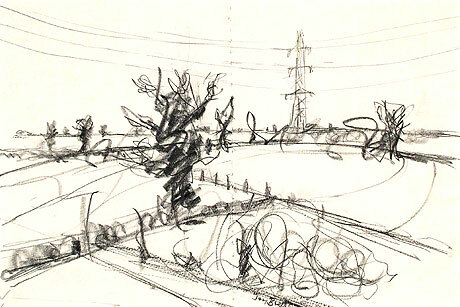 My quick sketches from a train journey has been a most useful part of this development: With quick transient drawings I am forced to recall what is essential to that view and composition within a few seconds. My media is graphite, charcoal, oil bars and more recently watercolour all of which have an immediacy of application which to capture the essence of my subject.